Our Sweet Apple Cider is made from pure pressed apples, with a touch of vitamin C to prevent browning. 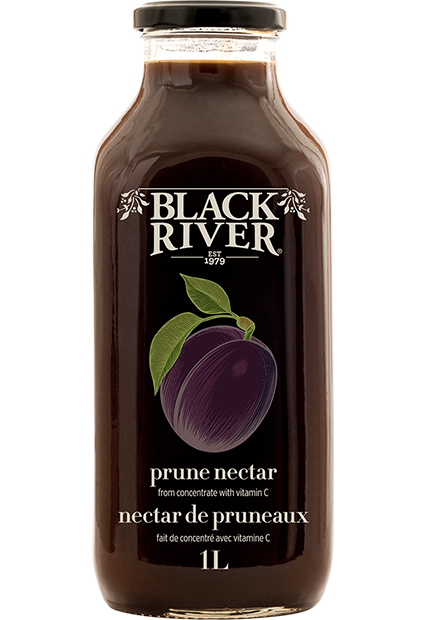 It has a sweet and slightly tangy taste and is made up of a blend of apple varieties native to Ontario (Macintosh, Mutsu, Empire, Courtland and Spy to name a few) that we press here at Black River. Sediment is normal, it's just the natural fibre from the fruit. 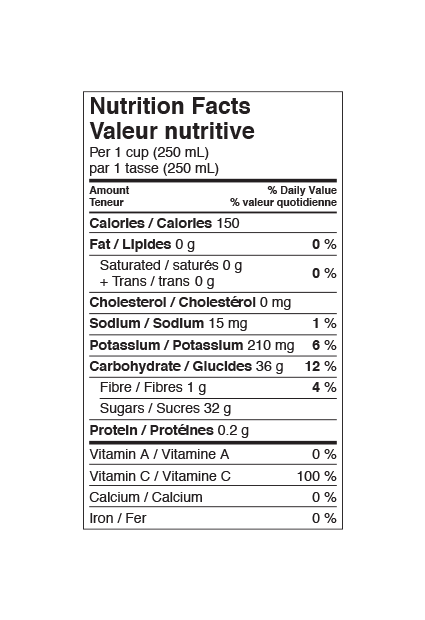 We get lots of questions about why our apple juice is called apple cider when all it is is pressed apples (there are no spices added to this juice); the simple answer is, it has to do with CFIA regulations around the definition of apple juice. It's pretty complicated, so we're going to leave it at that, but if you have more questions you are welcome to check out the CFIA website. INGREDIENTS: pure pressed apples, vitamin C.
Available in both 300ml and 1L sizes. 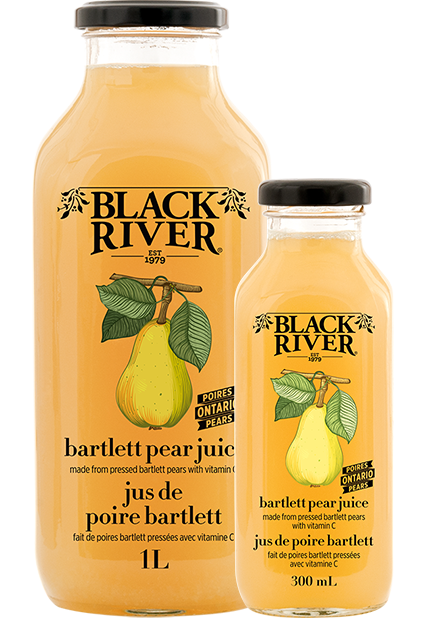 Made from pure pressed Niagara Bartlett pears, it literally tastes like you're biting into a ripe juicy pear! Pear juice can have quite a bit of sediment, don't worry, it's all good stuff. Give it a really good shake and enjoy! INGREDIENTS: pure pressed bartlett pear juice, vitamin C.
A lovely blend of pressed cranberry juice and a concentrated apple juice to balance the tartness. 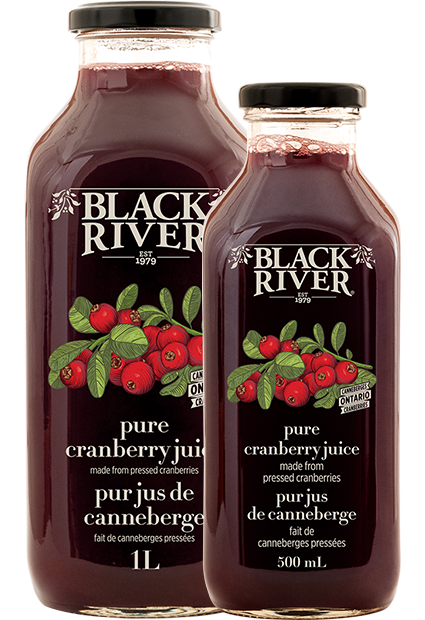 The cranberries come in from Muskoka, Ontario and we press them ourselves at Black River. There is no sugar added, it's all natural! Some sediment is normal, it's just the natural fibre from the fruit. INGREDIENTS: water, pure pressed cranberry juice, concentrated apple juice, vitamin C.
After tasting mango purées from all over the world, we found the most gorgeous flavours come from India! For this juice we've created a custom blend using Alphonso and Totapuri mango purées; one is slightly more sweet, one is tangy, perfectly complimenting each other. 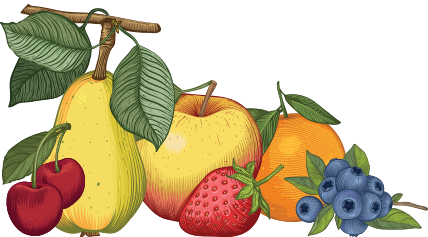 This juice is naturally very sweet, but all sweetness comes from the fruit, we haven't added any sugar at all. Some sediment is normal, give it a good shake and enjoy! 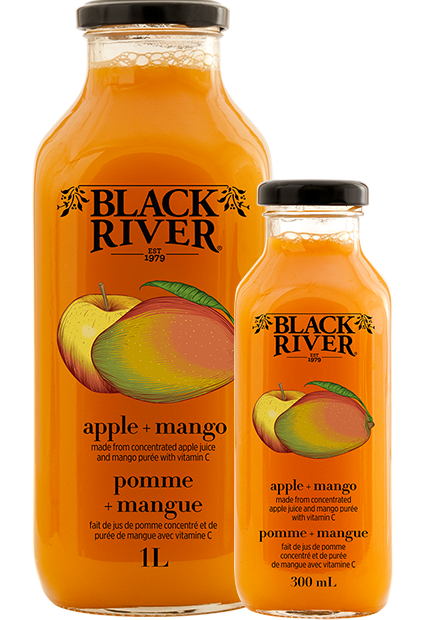 INGREDIENTS: water, mango purée, concentrated apple juice, vitamin C.
Our Organic Sweet Apple Cider is made from pure pressed organic apples, with a touch of vitamin C to prevent browning. 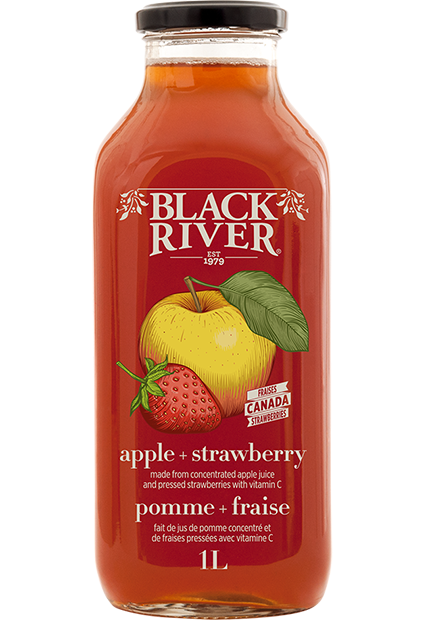 It has a sweet and slightly tangy taste and is made up of a blend of organic apple varieties native to Quebec. 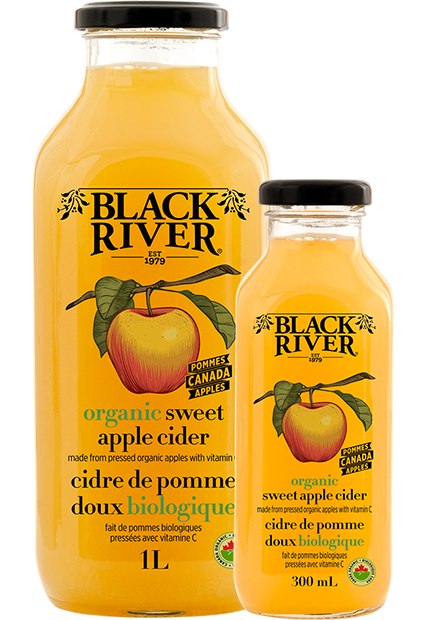 We are often asked why our Organic Sweet Apple Cider is darker in colour than our non-organic Sweet Apple Cider, the answer is simply that we are using a different variety of late harvest apples. Sediment is normal, it's just the natural fibre from the fruit. 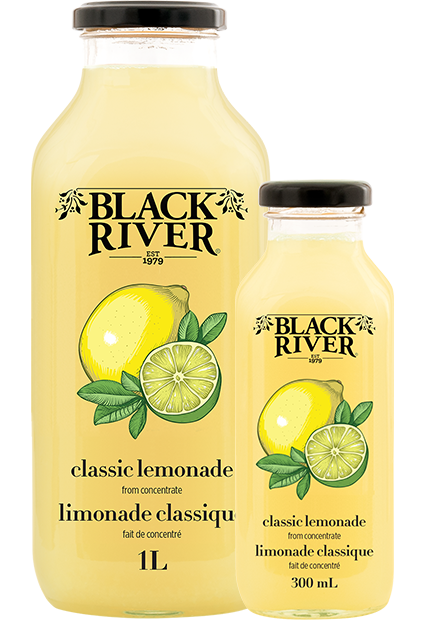 INGREDIENTS: pure pressed organic apples, vitamin C.
An elegant blend of lemon and lime with just the right amount of sweetness. This classic lemonade recipe is sweetened with cane sugar, but only enough to balance the tartness of the citrus. A refreshing summer treat and a great addition to a margarita! INGREDIENTS: water, cane sugar, concentrated lemon juice, concentrated lime juice, natural flavour. Blueberry pressing day at Black River is a fun one! The whole plant smells of these beautiful berries and we all make sure to take a break from our busy days to taste the juice right off the press. The blueberries are typically sourced from Quebec, British Columbia or Nova Scotia, depending on the success of the local crops. High in antioxidants, this juice is completely pure with absolutely nothing added. Sediment is normal, it's just the natural fibre in the juice, give it a good shake and enjoy! One of our signature juices, this powerful berry is all kinds of healthy, and it tastes rich and fragrant. 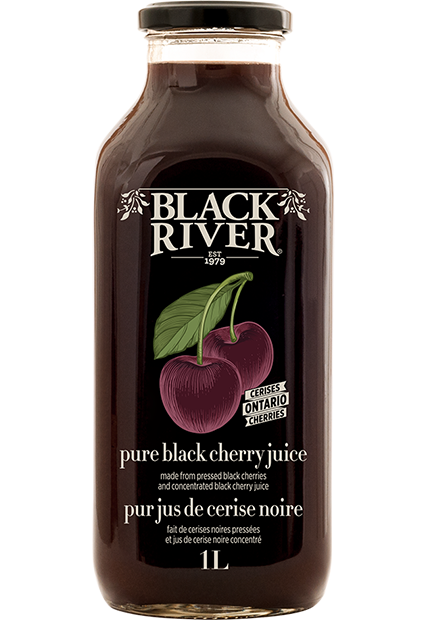 We source the black cherries directly from farmers in the Niagara region of Ontario and press them ourselves here at Black River. 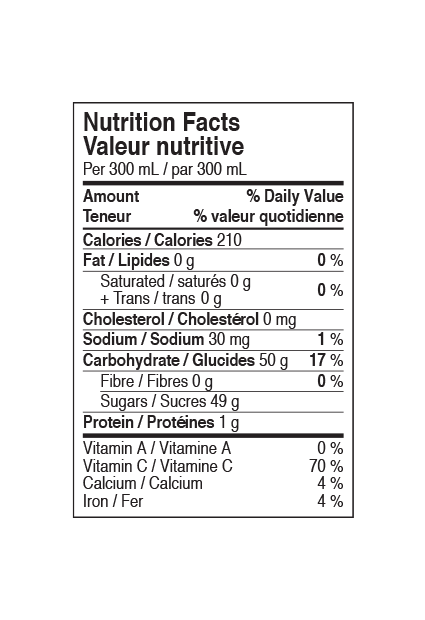 We do add a touch of concentrate to help balance the fluctuating sugar levels in cherry juice (sugar levels in the berries can be different from one side of the orchard to the other) but we make the concentrate itself out of Ontario cherries. Sediment is completely normal, it's just the natural fibre from the fruit. Shake well and enjoy this very special juice. 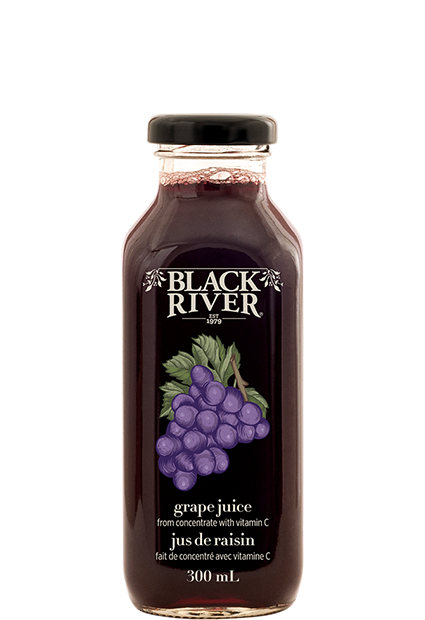 INGREDIENTS: pure pressed black cherry juice, water, concentrated black cherry juice. 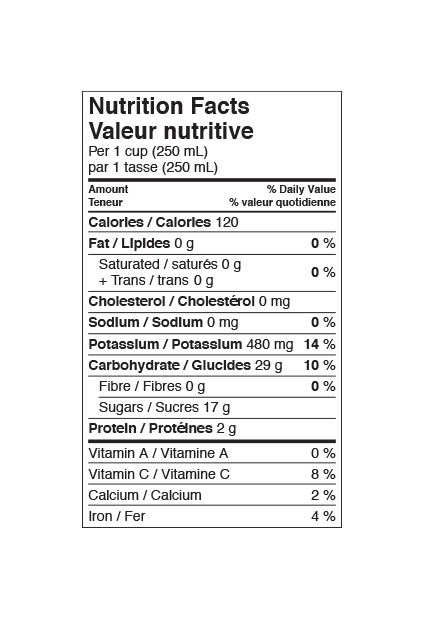 Our top selling pure juice, tart cherries are known for their health properties. Low in sugar, high in melatonin, and a natural anti-inflammatory, it is a favourite of athletes, insomniacs and gout sufferers alike. 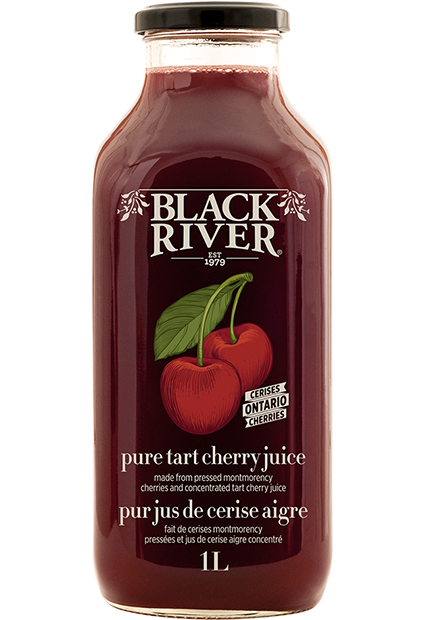 We source the tart cherries directly from farmers in the Niagara region of Ontario and press them ourselves here at Black River. We do add a touch of concentrate to help balance the fluctuating sugar levels in cherry juice (sugar levels in the berries can be different from one side of the orchard to the other) but we make the concentrate itself out of Ontario cherries. Sediment is completely normal, it's just the natural fibre from the fruit. Shake well and enjoy this very powerful juice. INGREDIENTS: pure pressed tart cherry juice, water, concentrated tart cherry juice. While we do produce many varieties of grapes here in Ontario, concord grapes are not readily available; so we go to our southern neighbour to find these delicious and very healthy little gems. There is a stretch of perfect grape growing conditions right below Lake Erie in New York State, USA; this is where we source our pure, pressed concord grape juice. Some sediment is normal, so give it a good shake and enjoy! 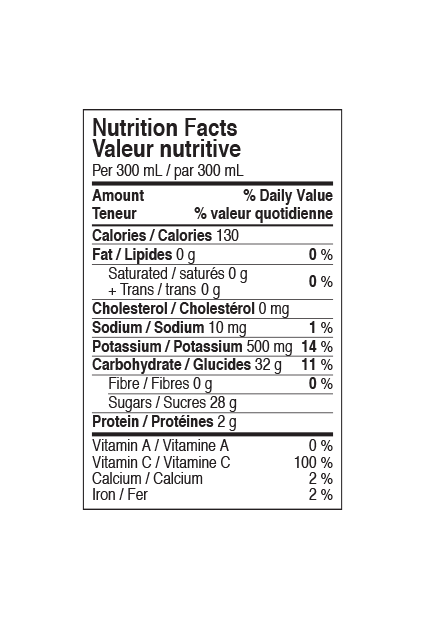 INGREDIENTS: pressed concord grapes, vitamin C.
*Have you seen any little specs in your grape juice that look like tiny crystals, or metal flakes? If so, don’t be alarmed! Tartaric acid is one of the main acids in grapes and it is present (typically in liquid form) in all grape juice (and wine!). It commonly crystallizes, and when it does, it tends to look like shiny metal flakes. So, if you happen to see any of these crystals, please don’t worry; tartaric acid is naturally occurring and even in crystal form, will not hurt you. The cranberry is a powerhouse in the fruit world. Extremely low in sugar and rich in antioxidants, this very healthy berry is known to provide relief from and prevent urinary tract infections, is a strong anti-bacterial and can improve digestive health. 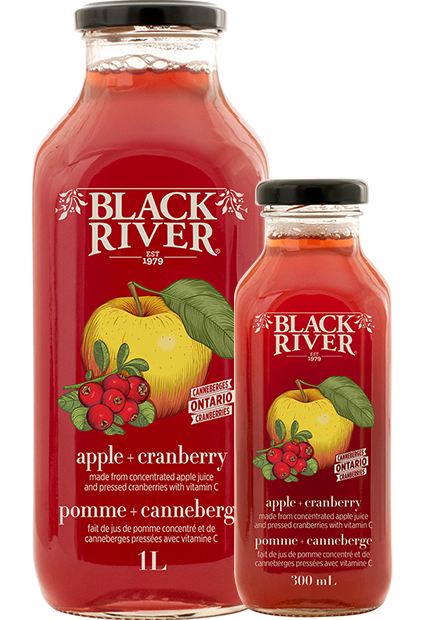 Made from cranberries grown in Muskoka, pressed here at Black River, there is absolutely nothing added. Pure cranberry juice is not for the faint of heart! 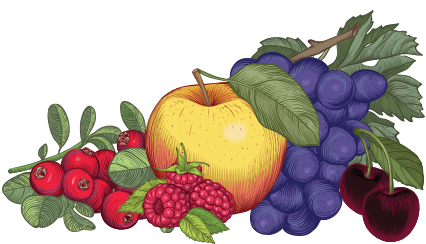 It is extremely tart, so many of our customers prefer to dilute it. Some sediment is normal, it's just the natural fibre of the fruit. Shake well and enjoy the benefits of this amazing superfruit! INGREDIENTS: pure pressed cranberry juice. Available in both 500ml and 1L sizes. Sourced from the sun rich region of South East Asia - where the very best pineapples in the world can be found! We add a tiny touch of vitamin C to prevent browning, but otherwise, this delicious juice is completely pure. Pineapple juice naturally separates quite a bit. We certainly could have added something to prevent the separation and make it a little more visually appealing, but we'd rather be all natural over here! Shake, shake, shake and enjoy this tropical delight! 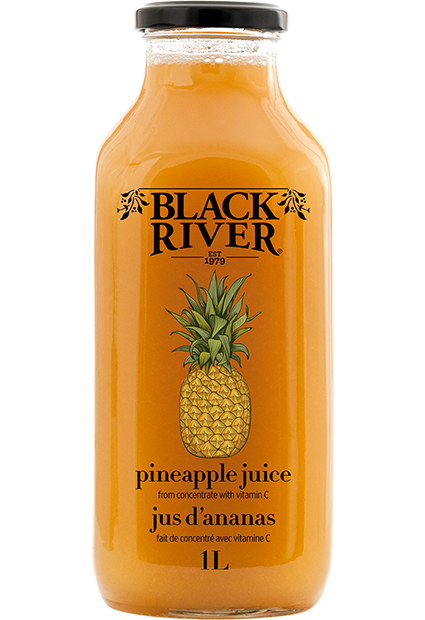 INGREDIENTS: water, concentrated pineapple juice, vitamin C.
Made from high quality concentrated prune juice sourced from the fruitful continent of South America, this sweet and slightly thick nectar is said to be a great digestive aid. Some sediment is normal, it's just the natural fibre in the fruit! Give it a good shake and enjoy moderately. Too much of this juice and you'll be racing for the nearest washroom! INGREDIENTS: water, concentrated prune juice, vitamin C.
An absolutely delicious blend of pressed strawberry juice and a concentrated apple juice, it tastes like homemade strawberry jam! 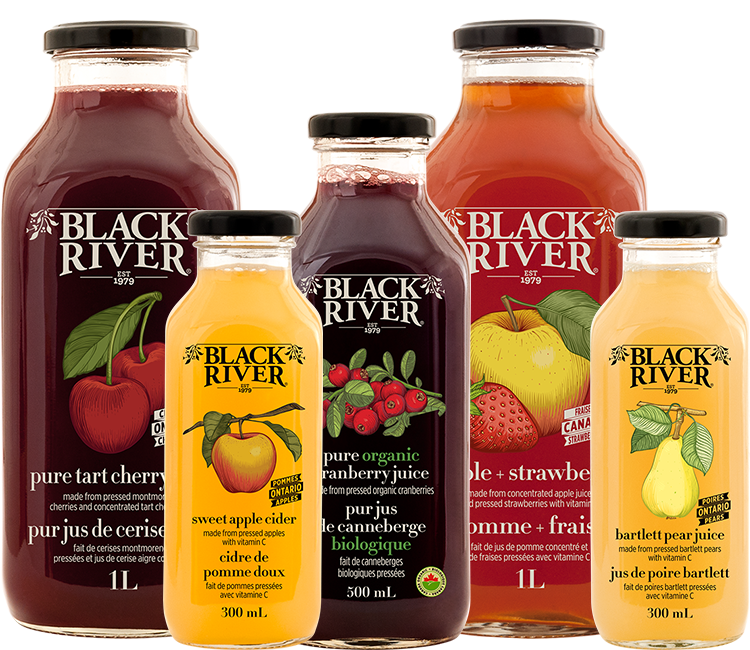 The strawberries can come from several different provinces in Canada depending on the success of the local crop, and we press them ourselves at Black River. There is no sugar added, it's all natural! Some sediment is normal, it's just the natural fibre from the fruit. 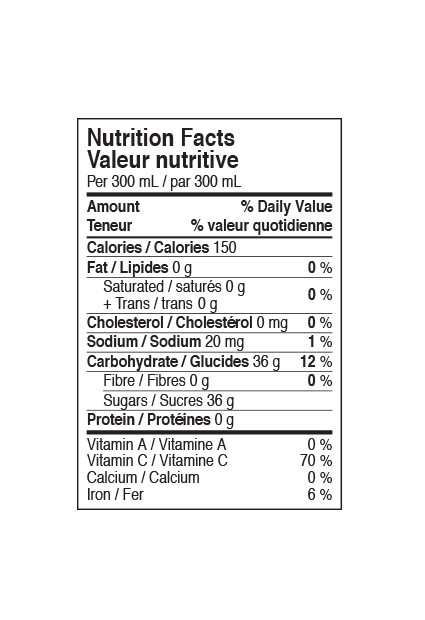 INGREDIENTS: water, pure pressed strawberry juice, concentrated apple juice, vitamin C.
Local Fruit Origin: Strawberries from Canada. Our take on the classic apple juice most kids love! 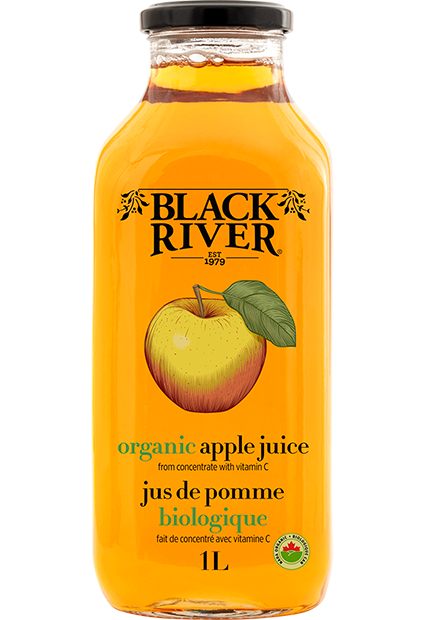 A touch of vitamin C has been added to prevent browning and it is more filtered than our Organic Sweet Apple Cider, but still made from just one ingredient - apples! 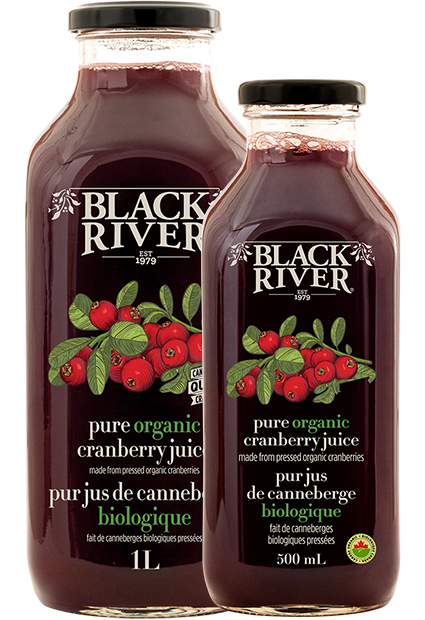 INGREDIENTS: water, concentrated organic apple juice, vitamin C.
The cranberry is a powerhouse in the fruit world. Extremely low in sugar and rich in antioxidants, this very healthy berry is known to provide relief from and prevent urinary tract infections, is a strong anti-bacterial and can improve digestive health. 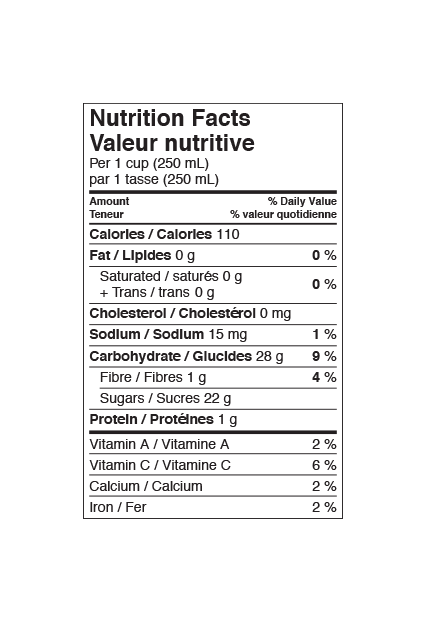 Made from organic cranberries grown in Quebec, there is absolutely nothing added. Pure cranberry juice is not for the faint of heart! It is extremely tart, so many of our customers prefer to dilute it. Some sediment is normal, it's just the natural fibre of the fruit. Shake well and enjoy the benefits of this amazing superfruit! INGREDIENTS: pure pressed organic cranberry juice. Did you know that farmers in Ontario are no longer growing concord grapes? It's true! While we do produce many varieties of grapes here in Ontario, concord is not one of them; so we go to our southern neighbour to find these delicious and very healthy little gems. 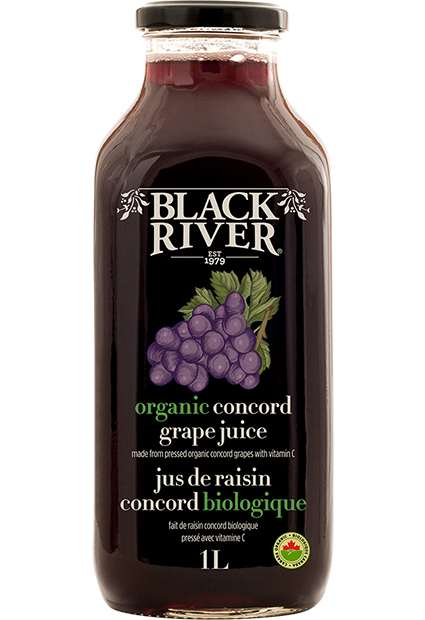 Our pure, pressed organic concord grape juice comes from Washington State, USA. Some sediment is normal, so give it a good shake and enjoy! 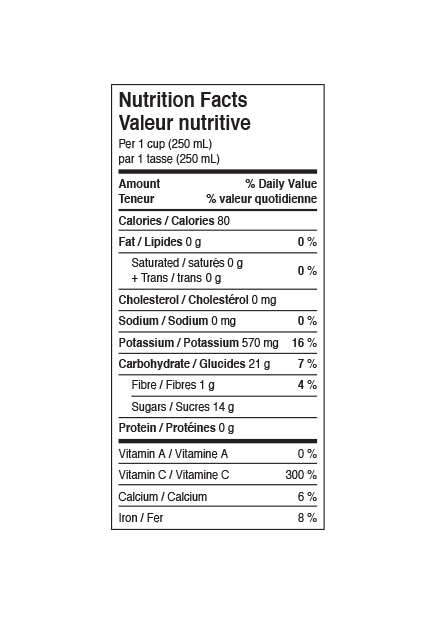 INGREDIENTS: pressed organic concord grapes, vitamin C.
Made from high quality concentrated pomegranate juice sourced from Iran, where the pomegranate is native to. High in antioxidants, this juice is completely pure and refreshing. Sediment is normal, it's just the natural fibre in the juice, give it a good shake and enjoy! Sky high in vitamin C, this superfood berry is a special one. 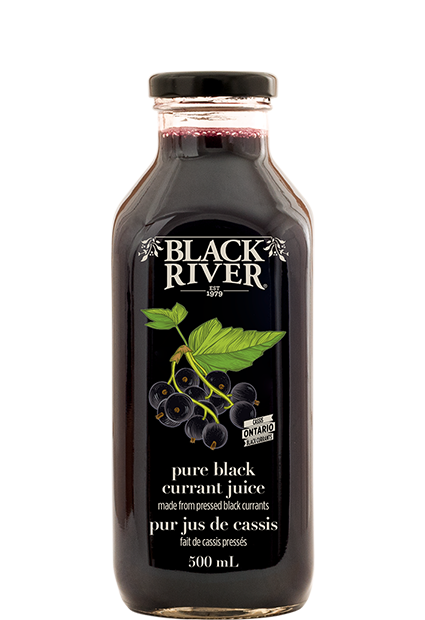 Pure black currant juice is a powerful antioxidant and is low in sugar. 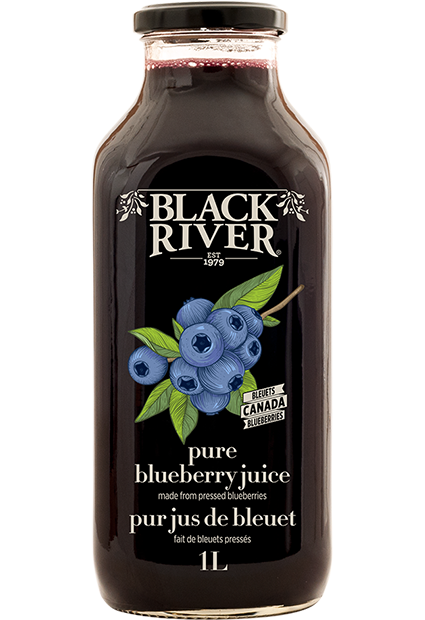 Sourced from within Ontario, these dark, rich berries are pressed here at Black River. What comes out of the press, goes into the bottle, we add nothing extra. Some sediment is normal, give it a good shake and enjoy! INGREDIENTS: pure pressed black currant juice. 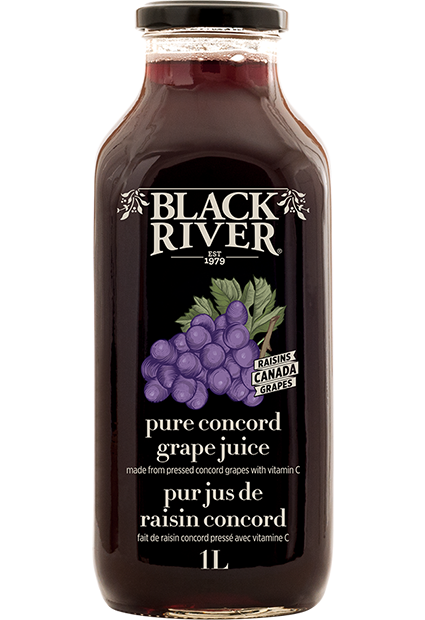 This sweet treat is made from a blend of concord grape and white grape juices, with a touch of vitamin C. The concord grape concentrate is made by a co-op of grape growers located just below Lake Erie. 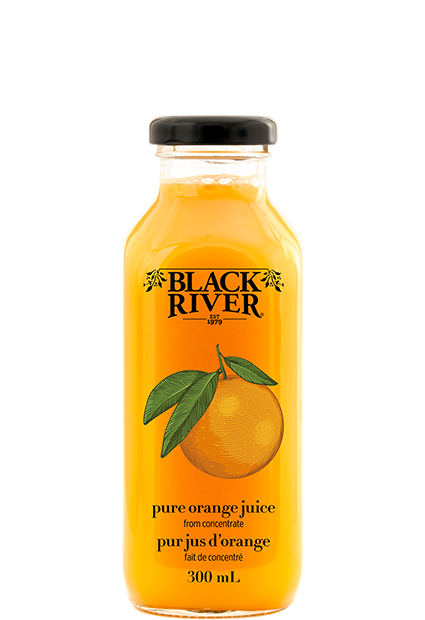 Naturally quite sweet, whatever sugars are in this delicious juice are naturally occurring in the fruit. Some sediment is normal, give it a good shake and enjoy! 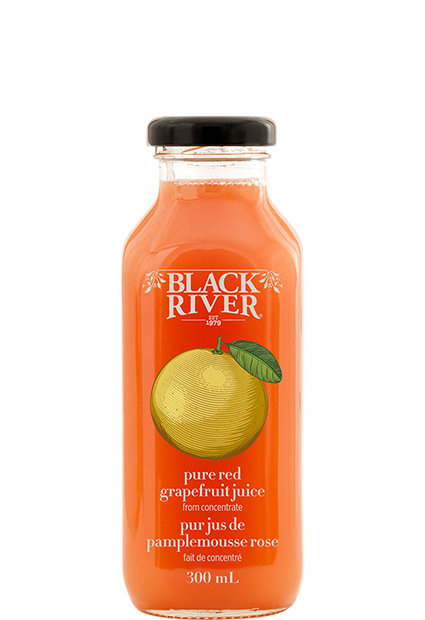 INGREDIENTS: water, concentrated concord grape juice, concentrated white grape juice, vitamin C.
As we don't grow grapefruit in Canada, we've sourced the most amazing red grapefruit juice from the southern US. This sweet, tangy juice will give you a full days worth of vitamin C. There is no sugar or preservatives added. Some separation is normal, shake well and enjoy! INGREDIENTS: water, concentrated grapefruit juice. As we don't grow oranges in Canada, we've turned to the experts in Brazil - one of the largest growers of oranges in the world. Sweet and tangy all at once, this pure orange juice is the pop of vitamin C that you need to start your day right. No sugar added, no preservatives - it's all natural. Some separation is completely normal, give it a good shake and enjoy! 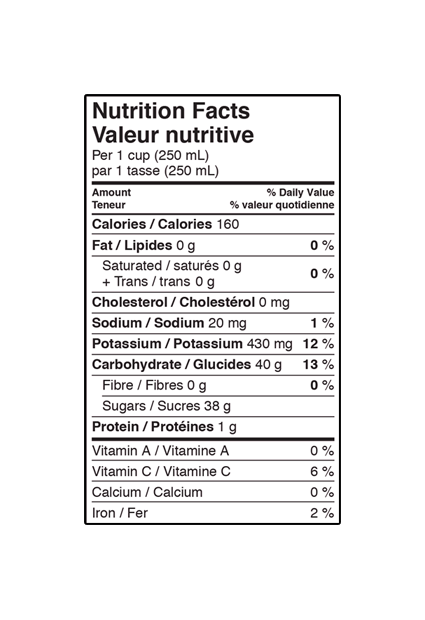 INGREDIENTS: water, concentrated orange juice. A unique blend of pressed raspberry juice and a concentrated apple juice to balance the tartness. 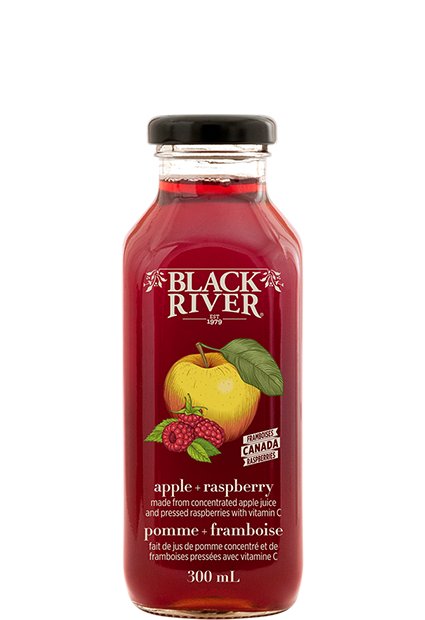 The raspberries come in from British Columbia and we press them ourselves at Black River. There is no sugar added, it's all natural! Some sediment is normal, it's just the natural fibre from the fruit. 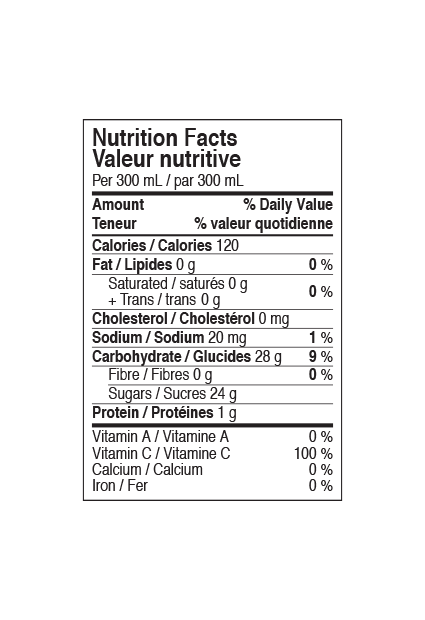 INGREDIENTS: water, pure pressed raspberry juice, concentrated apple juice, vitamin C.